Growing up in a middle-class neighborhood, my buddies and I were in awe of Mr. Smith (his real name) and his garage workshop. He was a retired mechanical engineer with more tools than any of us had ever seen. From cars to appliances to broken windows, electrical shorts, and clogged drains, neighbors came to him with questions and for help. He always had the right tools and, most importantly, always had the knowledge and the right answers. Think of me as a Mr. Smith. In my 35+ years as a marketing professional, I’ve accumulated vast knowledge, answers, tools, expertise, and knowhow to fix or solve or simplify just about every marketing challenge, problem, or conundrum there is. And I love to help. As a marketing strategist and consultant, I spend most my time these days working with medium-sized businesses. They know they need experienced, professional help and, for the most part, they understand that help comes with a price. Smaller businesses and startups need professional support, too. But too often, they don’t have deep pockets to get experienced, professional support. That’s especially true when it comes to marketing. I grew up in and around small businesses. I admire the many business owners I met who overcame huge obstacles to start and build a profitable small business. That’s why I created My Marketing Handyman… as a way of providing a range of marketing services to the owners of smaller businesses and startups who would appreciate the advice and knowledge I can bring to the table at a price they can afford. 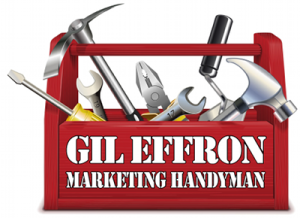 First, follow My Marketing Handyman on your favorite social media platforms: Facebook, Twitter, LinkedIn, Pinterest, and Instagram. And, of course, let an owner of a smaller business you know about My Marketing Handyman and how he can find me. www.MyMarketingHandyman.com. This entry was posted in Marketing and tagged good marketing, Marketing handyman, small business. Bookmark the permalink.